Woodbine newcomer Daring Duchess led from start to finish over 1-1/2 miles on the E.P. Taylor Turf Course to take the $100,000 Flaming Page Stakes on Saturday afternoon for owners Kenneth and Sarah Ramsey. Trained by Michael Maker, Daring Duchess notched her first win of the year in the overnight stakes event for fillies and mares three years old and up. After getting away with soft early fractions, Daring Duchess and jockey Rafael Hernandez turned aside a challenge in the final quarter-mile from the only three-year-old filly in the race as Get Explicit ran on late to finish second after a slow start. Favourite Creative Thinking tracked inside behind the front-running Daring Duchess and held third over Giovanna Blues, almost four lengths back. 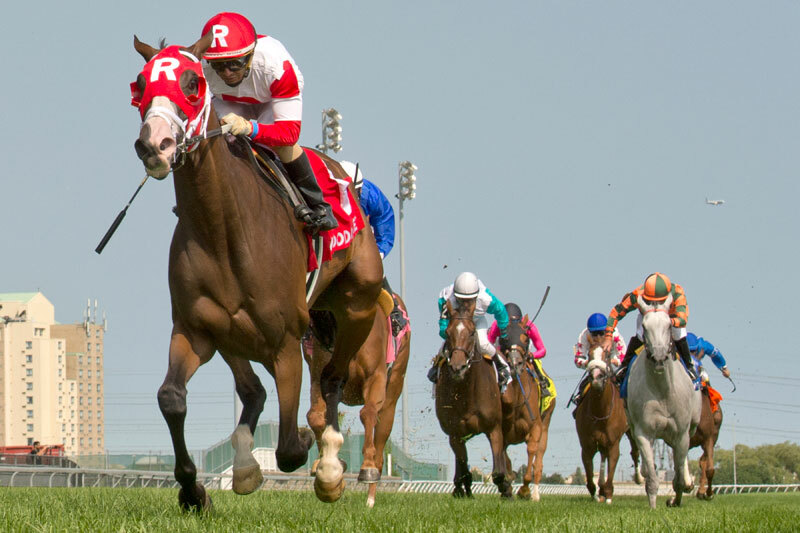 The six-year-old Arch-A True Pussycat mare had earned runner-up honours in three of her five turf stakes assignments stateside this year although she entered the Flaming Page off a 10th place finish in the Grade 3 Modesty Handicap on July 7 at Arlington Park. The Kentucky-bred mare was victorious in a final time of 2:31.16 by 3-3/4 lengths over the ‘good’ course after setting fractions of :27.36, :54.09, 1:19.08, 1:43.13 and 2:06.67. Daring Duchess, who has earned half of her six wins in stakes competition, improved her career record to 6-5-2 from 27 starts while boosting her bankroll over $400,000. Sent postward as the 7-2 second choice, Daring Duchess paid $9.10, $4.50 and $2.90. She combined with Get Explicit ($5.80, $3.50) for a 1-8 exacta worth $49.50. Creative Thinking ($2.50) completed the 1-8-3 trifecta, which paid $88.75 for a $1 ticket. With Giovanna Blues finishing fourth, a $1 superfecta of 1-8-3-2 returned $220.20. Galileo Gal, Liberty Kitten and pace-stalker Daddy’s Great Bay completed the order of finish. Lottie was scratched.